We are an individual first even if we belong to a community or a family. Be happy with yourself so much that you are not dependent on others for your happiness. That’s putting condition to your happiness. Add hobbies/interests and find something to do in this life that makes you useful. Be the biggest motivator of yourself. 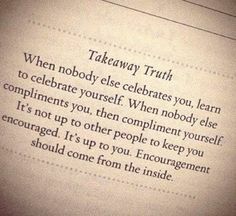 Encourage yourself at times when you are not happy and cheerful and things seem to be gloomy. Create your own happiness. That way when you are around other people, you will be enjoying your own company and others too. You will know that I am being liked because of my own deportment. I am pleasant that’ s why people like me not the other way round that person is nice that’s why I like him.